How Does CEREC in Crookston Work to Restore Your Smile? Every moment that you go without a complete, healthy smile can seem like an eternity. Every meal is a chore. Every selfie is another reminder that your teeth aren’t in great shape. In a fast-paced world, it sometimes feels like traditional methods of restorative dentistry take forever. CEREC is the innovative technology that is delivering new pearly whites on demand. How does CEREC in Crookston work? First, your dentist will prepare your teeth to receive your crown and/or bridge. This might involve removing decay or damage. CEREC captures a digital impression of the area where the crown will go. It uses a 3D camera and specialized software to accomplish this. Your dental professional team uses the digital impression to design your new smile. CEREC’s milling unit uses a block of dental grade porcelain to create the new crown or bridge. Finally, your dentist in Crookston puts your new dental device in its place, and you leave the office feeling brand new! Instead of wearing temporary protection for your teeth while you wait for a permanent crown or bridge, you’ll have your final restoration piece in place after just one visit to the office. CEREC’s quick work could prevent further damage to your teeth because permanent crowns and bridges provide better protection than temporary ones. There is no compromise on quality. CEREC crowns and bridges may last for a decade or more if you care for them well. CEREC creations can look and feel like natural teeth. No one will know you have them unless you decide to brag about how quick and easy it was to get your new crown. Does CEREC Work in Every Case? Your dentist will examine your teeth and make a recommendation on whether CEREC will work for you. It’s generally a great option for patients who want to experience quick and simple dental restoration. It’s also wonderful for folks who need a crown but who want to keep as much as their natural tooth as possible. However, if your teeth are too badly damaged, a crown or a bridge might not be ideal for your situation. Your dentist might recommend that you receive implants or undergo another dental procedure. Thanks to CEREC, you might be only one dental visit away from a restored smile! Dr. Jaclyn Jensen is your professional care expert at Renu Dental Care. 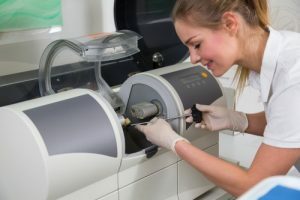 Along with the rest of her team, she uses CEREC and other technology to ensure that her patients experience the best that modern dentistry has to offer. If you want to learn more about CEREC and what it can do for you, contact Renu Dental Care at 218-281-1301. Comments Off on How Does CEREC in Crookston Work to Restore Your Smile?